Give the gift of airline travel — an experience your friends and family will never forget! With over 80 destinations to choose from, this gift is sure to please. 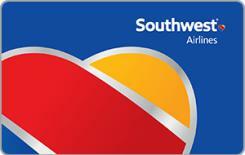 The Southwest® gift card is easy to redeem online, by phone, or at the airport. No fees and never expires.